His battle-scarred heart stands in the way of a love that could heal him. Scottish Highlander Alex MacDonell returns home from fighting for clan and king to discover that the girl he once hunted and fished with has become an intriguing young woman. Kenna has adored him for years, but he always treated her like a little sister. When her own brother dies from battle wounds, Kenna is left with no family or home. Alex would love Kenna if he could, but recurring nightmares of acts he committed while hunting down Covenanters now haunt his days and nights. When Kenna comes too close to his heart, he pushes her out of his life—and into the arms of another. Too late, he regrets his impulsive actions. Now he must fight to win her back before she weds another and is lost to him forever. 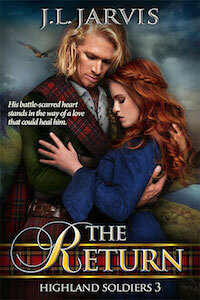 Book 3 in the Highland Soldiers series, Scottish historical romances set during the turbulent Covenanter times of seventeenth century Scotland.